444 Social, a 302-unit luxury apartment community located in Lincolnshire, Illinois. Mr. Greenberg has elevated the lifestyle residential experience with a variety of innovations in building design and community amenities, including trailblazing an on-line platform (solely for residents) in order to improve the residents’ connectivity and interaction with onsite property management, and sense of community, with the goal of improved resident retention. Hotel EMC2, a 195-room full service lifestyle hotel located in downtown Chicago themed around the intersection of Art & Science and one of the top featured hotels within the upper-upper lifestyle Autograph by Marriott Collection Brand®. theWit Hotel, a 310-room full service lifestyle hotel located in downtown Chicago, which also features ROOF, “one of the top three rooftop lounges in the world.” (Travel + Leisure). CityPark Lincolnshire, a 50-acre mixed use development in Lincolnshire, Illinois including Viper Alley, a live entertainment and private event facility. Recently, Mr. Greenberg has founded SMASH-AI Labs, which is pioneering new forms of hospitality-based entertainment and leveraging the new tools of Augmented Reality, Computer Vision and Machine Learning in order to delight visitors. Mr. Greenberg’s background spans 30 years in various aspects of low and high-rise construction, land development and financing. With a transaction history totaling nearly $1 billion, Mr. Greenberg has been directly involved in the ownership and operation of for-sale residential, rental apartments, industrial, retail, office and hospitality properties. While financially conservative, Mr. Greenberg’s formula for success arises from his ability to fuse art, technology, trends and design, to deliver uniquely impactful consumer experiences, which consistently outpaces his competition. He revolutionized the lifestyle hotel segment with theWit Hotel, earning the “Developer of the Year” award by Hilton for this signature development, and Hotel EMC2 has been awarded the Autograph Hotel new hotel of the year for 2017 by Marriott Corporation. Mr. Greenberg typically looks outside of the retail and hospitality industry for inspiration. He is a master of trend-spotting and translating lifestyle behaviors and entertainment into a live experience. In 2012, Mr. Greenberg created the first dedicated and permanent 3D video-mapping surface in a rooftop lounge. This provides a more compelling entertainment experience of 3D optical illusion and imagery for enjoying world-renowned DJ performances. 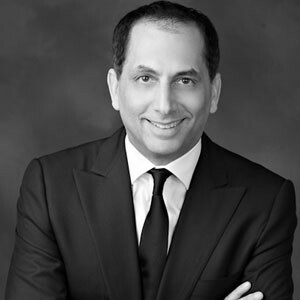 As President of SMASHotels and founder of SMASH-AI Labs, Mr. Greenberg will continue to build the next generation of dynamic, engaging, purposeful and interactive hospitality environments which will meet the changing expectations of tomorrow’s consumers and tenants, in various markets across the country. Mr. Greenberg’s business affiliations include The Economic Club of Chicago and The International Trade Association of Chicago. Mr. Greenberg received a Bachelor’s Degree from Claremont Men’s College and a Master’s Degree in Business Administration from Columbia University.